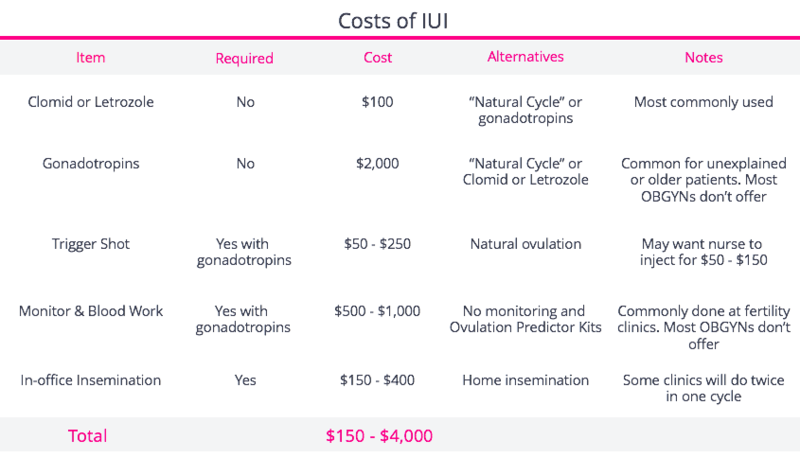 A typical IUI cycle costs $500 to $4,000 with three critical inputs that determine the final price. Medication: Drugs can serve a variety of purposes but they principally help to ensure that a woman ovulates one or more eggs at the right time. Clomid or letrozole is most often used and costs $100 per cycle. Gonadotropins are given when a stronger response is required and costs $2,000 per cycle. Finally, a “trigger shot” is often (but not always) given to induce ovulation and costs $50 - $250. Monitoring & Bloodwork: This allows your doctor to ensure that follicles (containing eggs) are growing, but not at a rate or speed that could be dangerous and lead to a multiple gestation birth. Pricing models vary but typically monitoring and blood work cost $500 - $1,000 per cycle. Insemination: This represents the process of actually injecting sperm into the uterus and costs $150 - $400. The data suggests doing a second injection a day after the first might minimally improve the odds of success for that cycle (but this is not standard). If a patient does not have insurance coverage for fertility treatment, IUIs are unlikely to be covered. If a patient does have coverage, the degree to which IUIs are covered varies. A patient’s employer generally dictates whether IUI will be covered, for how many cycles, and whether it is a requirement before progressing to IVF. When the insurance carrier (and not the employer) designs the policy, we notice insurers like Optum/United are more pessimistic about IUI, believe they’re of lesser value, place a cap on the number that can be used, and seldom require it to advance to IVF. Alternatively, Aetna takes a more positive view of IUI, often places no limitations on the number of IUIs patients can have subsidized, and requires patients to try IUI multiple times before advancing to IVF. Even more specifically, some plans will cover IUI, but only if that IUI includes or excludes certain drugs (clomid, letrozole, or gonadotropins) given the patient’s condition. For example, many plans are reluctant to cover an IUI using gonadotropins. This is because they question the trade-off of cost ($2,000 for the drugs) and risk (higher risk of multiple births) in light of the benefit (slightly higher birth rate). Additionally, which specific person carries the insurance policy can influence what is paid for. For instance, under some plans, if the man’s coverage pays for IUI, insurance will only cover “his treatment,” namely the sperm wash. The policy may not pay for drugs the female partner will take during IUI or even the insemination itself. If clomid, letrozole or especially gonadotropins are used during an IUI, the risk of a multiple birth increases dramatically. However, that is if a pregnancy even happens in the first place after IUI. Since IUIs seldom lead to a pregnancy, the absolute risk of a multiple birth after a single IUI cycle is 1 - 3%. Twin and triplet births can be costly at the time of delivery and as future children mature. Twin births often cost $100,000 in immediate medical expenses and triplet births are closer to $400,000. Often times an insurer will cover many of these costs but to patients with high deductible plans, or no insurance at all, they may be responsible for a fair amount of these costs. Multiple-gestation babies are born prematurely 57% of the time for twins and 96% of the time for triplets. Offspring born from multiple gestation births are also five times more likely to develop cerebral palsy. Below is a sample rundown of expenses that may impact the family on a go-forward basis. Also, we should note that if US insurers are allowed to raise premiums based upon a person’s pre-existing conditions (like cerebral palsy, or even cesarean birth) the risks and costs for having a premature infant will rise. This is not factored in below. 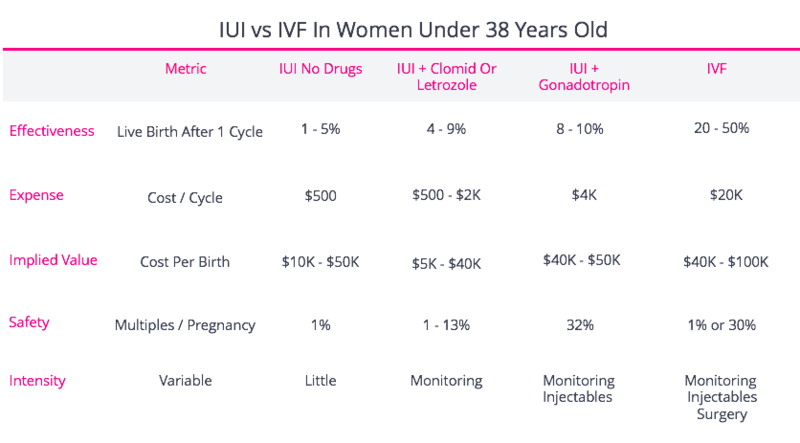 While an IUI cycle costs $150 - 4,000, an IVF cycle typically costs roughly $20,000 per cycle ($12,000 for treatment, $5,000 for drugs, $3,000 for add-ons).